President Donald Trump is asking the Justice Department to develop strategies to prevent and prosecute violent crimes against law enforcement. Trump says in the Oval Office that police officers have “had it with what’s going on” and notes that 118 law enforcement officers died in the line of duty in 2016. Trump signed a proclamation to mark Peace Officers’ Memorial Week and Police Week. He was speaking Monday to the National Peace Officers’ Memorial Service on Capitol Hill, PBS reports. 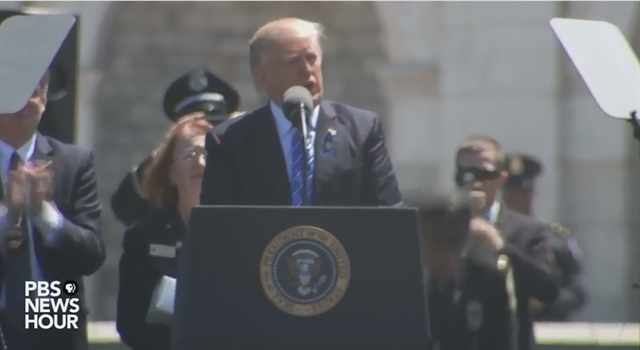 Trump also addressed law enforcement and family members of the fallen at the 36th Annual National Peace Officers’ Memorial Service outside the U.S. Capitol Monday, reaffirming his campaign promises to restore justice and end attacks on police. “Every drop of blood spilled from our heroes in blue is a wound inflicted upon the whole country,” Trump said. “And every heartache known by your families in law enforcement is a sorrow shared by the entire family of the American nation,” PBS reports.